Sarah Ferguson claims her and Princess Diana were never rivals. Source: Getty. They were painted as fierce rivals after both marrying into the royal family, but Sarah Ferguson has always insisted that she and Princess Diana were actually good friends. And now, as Buckingham Palace takes action against online abuse aimed at duchesses Meghan and Catherine, Fergie has slammed cruel online trolls in a heartfelt open letter, comparing comments pitting women against each other to the nasty rumours about her and Diana years ago. Writing for Hello! magazine, as part of their new #hellotokindness campaign, the Duchess of York has hit out at the “extraordinarily abusive comments” on websites and social media – claiming the “bullying, sniping, bitching, appalling sexism, racism and homophobia” is getting out of hand. While Fergie said she enjoys using both Twitter and Instagram to post personal messages, family photos and charity campaigns, she admitted the comments and depths some people will go to online “terrifies” her. Shockingly, just hours after the magazine published Fergie’s open letter, she was inundated with more cruel comments on social media. Having read some of them, she has since hit out at the trolls – saying all they have done is prove every one of her points. “Responses on a news site to my warning online discourse has become a sewer: ‘Stay out it [sic] lady; Yorks don’t need to be dragged into this fight – Shut it!’… ‘I suggest you crawl back under your rock’… ‘oh god – Yorkie bar is back!’… They rather make point for me #HelloToKindness,” she wrote on Twitter. It comes after the publication previously revealed that Kensington Palace staff are now being forced to spend hours moderating offensive comments aimed at Meghan and Catherine, many of which are described as “sexist and racist” while some even contain threats towards the royals or other ‘rival’ fans. 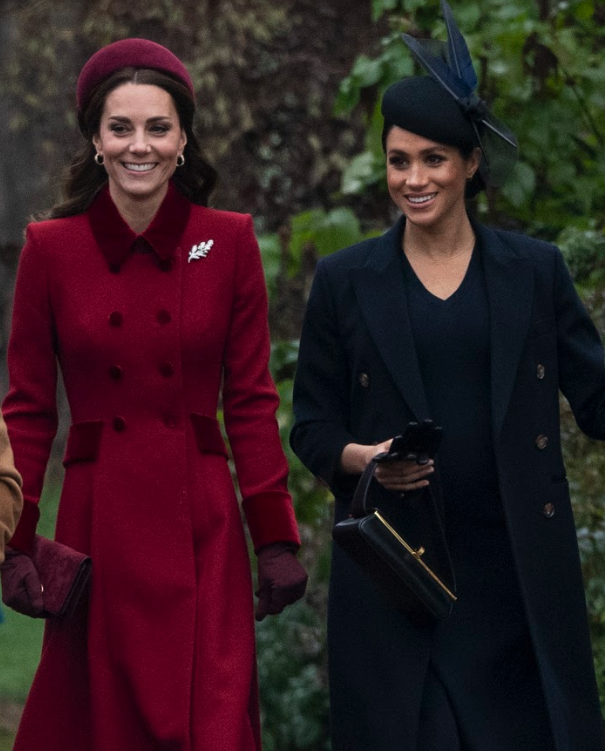 Catherine and Meghan put on a friendly display at church in Sandringham over Christmas. Source: Getty. The royal family have several Instagram and Twitter accounts, covering all members of the royal family across Buckingham Palace, Clarence House and Kensington Palace. The main royal Instagram account alone has 4.5million followers, while Kensington Palace, (which covers all of Meghan, Prince Harry, Catherine and Prince William’s activities) has 7.1million. “There’s a wider narrative in the media pitting them against each other, and unfortunately people are piling in and taking sides,” Emily Nash, the magazine’s royal editor, explained to CNN. Despite the ongoing claims of animosity between them, Meghan and Catherine have appeared amicable with each other on outings in recent months and happily walked side by side as they arrived for a church service at Sandringham over Christmas – showing no signs at all of any issues. What do you think of Fergie’s open letter? Do you agree that more needs to be done to stop online abuse?